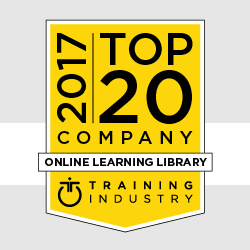 Training Industry names Prositions as a 2017 Top Online Learning Library Company | Prositions, Inc. Training Industry names Prositions as a 2017 Top Online Learning Library Company | Prositions, Inc.
Prositions, Inc. has received the distinguished honor of being selected as one of the 2017 Top 20 Online Learning Library Companies by Training Industry. In the past year, Prositions has produced and curated thousands of high-quality training titles on essential workplace topics like leadership, customer service, technology basics, and safety. The majority of these programs were designed in a micro-learning format that meets the needs of today’s learners looking for convenient, mobile, and bite-sized learning. To browse Prositions’ training titles and learn how our approach to learning can strengthen knowledge retention and engagement, visit https://prositions.com/training-content/ or call 1-877-244-8848.